According to internet lore famed GM design chief Harley Earl suggested a coupe pickup as early as 1952, but the Ford Ranchero beat the Chevy El Camino to market by a few years...it doesn't matter because for whatever reason, the El Camino name is "stronger" and has become generic for any coupe pickup in the same way that Kleenex is to tissues, Xerox is to photocopies and Detroit is to crime. Therefore, if you take one BMW New Class and El Caminoize it, you've got a New Camino. 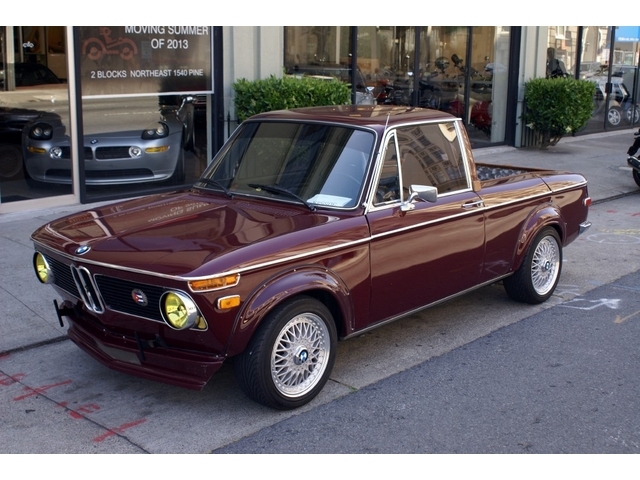 Find this 1971 BMW 1600 El Camino with M20 engine for sale in San Francisco, CA for $16,900 buy-it-now on eBay. Tips from Morgan H.
This BMW was converted to its current El Camino configuration by an independent BMW shop, ostensibly to haul parts and promote its business. Whatever the reason this is one of the better looking BimmerCaminos we've seen and has an updated M20B25 inline-6 from an E30 325i with a few aftermarket parts; expect something around 200 horsepower as set up. You will get wet when it rains, but that is a small price to pay for Camino nirvana and this example with manual trans and 3.94 LSD gearing in the rear should be a drift machine. Nice execution. I'd drive this every day if I could get some kind of rain & wind guard for the back. Maybe a camper shell? I've always been kind of ambivalent about this type of conversion. Yah, it looks utterly cool, but with all the metal work that had to take place, why not create a functional tailgate? Difficult, yes. Impossible, no. Perhaps, with the body gaps still in place, what's left of the deck lid still lifts up?